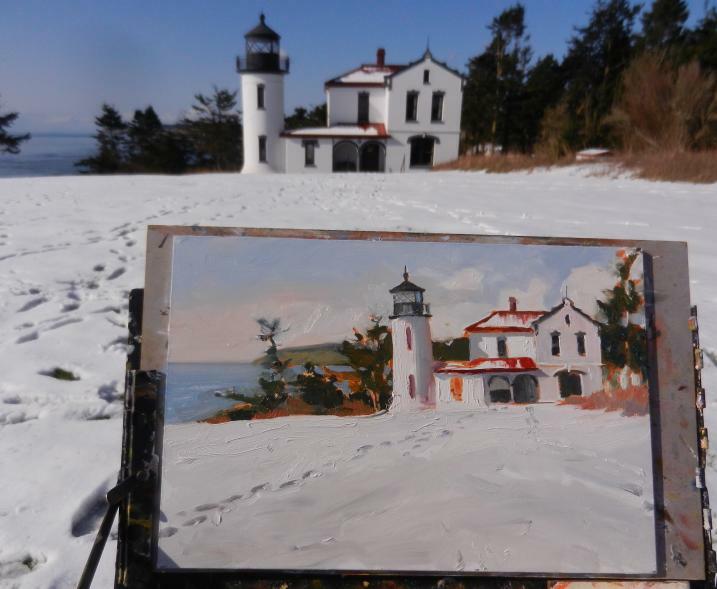 I have painted this view of the lighthouse before in watercolor back in 05 I think...But never had the chance with snow on the ground! By the end of the day my face was sunburned from the intense sun reflecting off the snow. 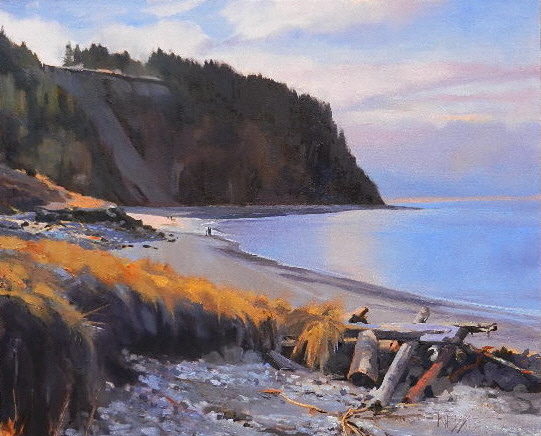 Sometimes it is a challenge to paint complicated architecture on location. For this painting I used a plexiglass sheet to draw the outline of the structure in a grid to give me an idea how the shape would fit within the format of an 8x 12 panel. I didn't trace the outline but just used it like a preliminary drawing. This helps to speed up the layout in fast changing light situations. It also helps to have friends along to paint with!! Sylvia Carlton set up next to me and it was like having a stand up comedy act right next to you while your working!...=] ..It was also pretty cool to see how our different styles of painting progressed. Friendly deer kept walking by too....adding to the fun! Lots of folks turned out for Friday afternoon at the lighthouse. Susan McManamen found a good side view. 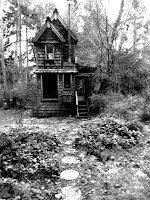 She also graciously allowed me to camp out in the driveway of her familys cabin near Coopville for the night, so I would be able to start early at Ebeys Landing in the morning! 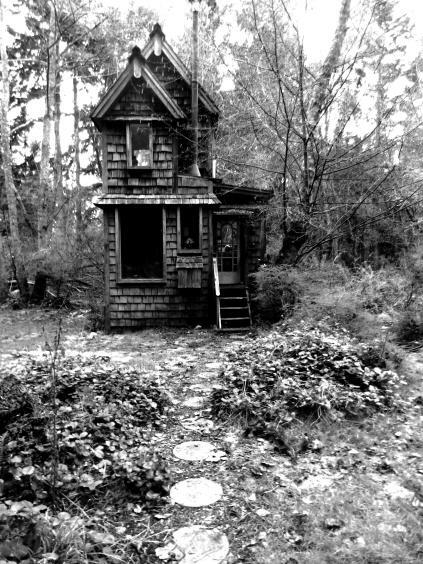 And this is a cool little cabin! only 300 sq. feet, nestled in a wooded landscape reminiscent of something out of The Hobbit...All in all a very interesting weekend and this is only Friday! 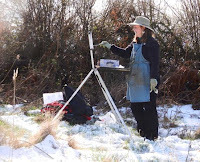 After I finished the Snowfield painting, It was still cold but the sky was beginning to clear. I found this spot looking towards Fort Casey across the little inlet where the Keystone Ferry comes in. I believe that is plumes of smoke coming from the paper mill in Port Townsend across the bay. 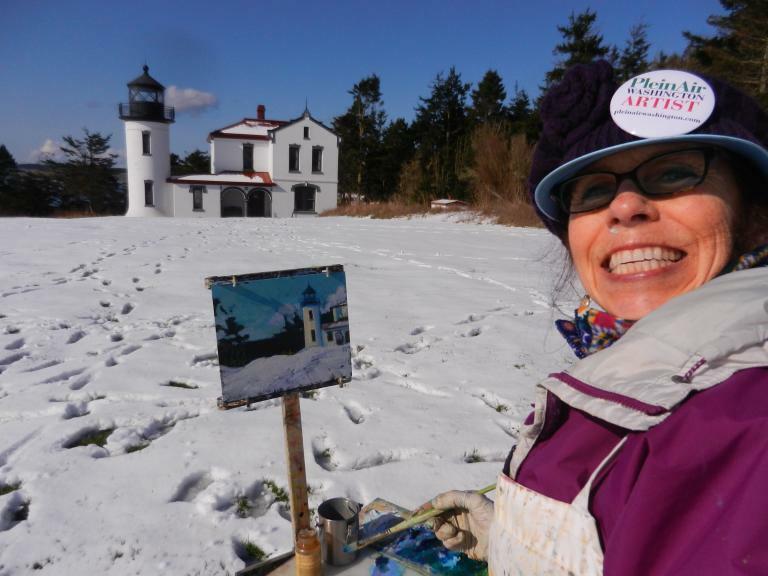 After I was done with this painting it had warmed up enough for me to get the van unstuck and we all headed for the Lighthouse at Fort Casey. Here is the same view on a clear sunny day. 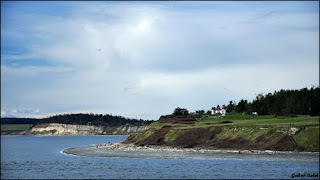 I took this photo from a parks website..You can clearly see the lighthouse but I never saw it on Friday! After getting my van stuck in the snow upon departing the Keystone ferry on Whidby Island there was not much else to do but paint! A freak snow storm that drew a pencil line around the island and parts of Everett dropped about six inches of snow. Fortunately there were some other hardy painters who showed up for the first outdoor paint out organized by the Plein Air Washington Painters. 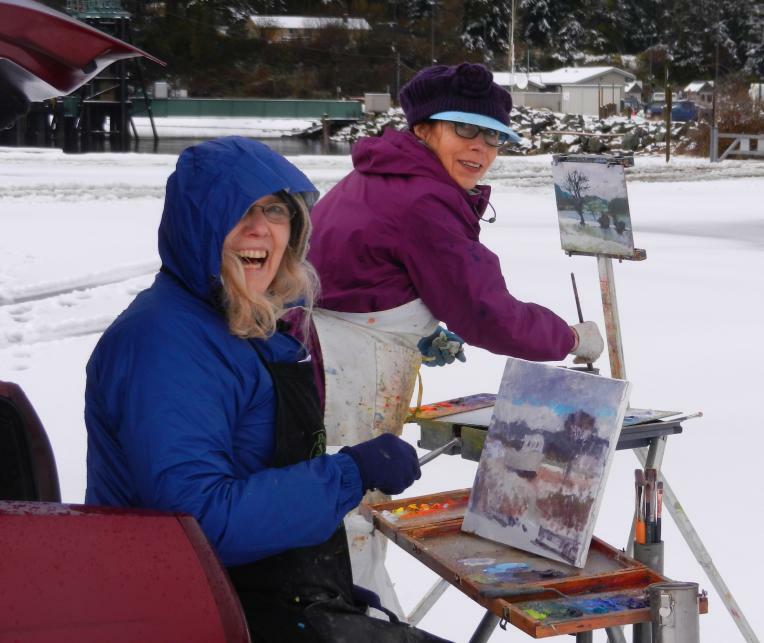 Jane Wallis and Sylvia Carlton decided to use the car as a wind break and happily painted away. 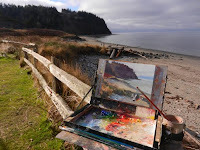 I wasn't so smart....But loved the view and managed to push the stiff paint into an acceptable painting. Sure was nice to hit the Keystone Cafe' for a hot cup of coffee! 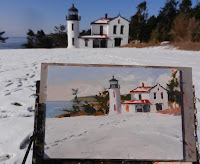 By the time we finished our paintings the sun came out and melted the snow enough for me to get the van out of the parking lot and head up to the Light House....which had been closed due to the weather! We have officially started the new year of PA painting with The Plein Air Washington Painters this weekend on Whidby Island...and what a time it was with snow blizzards and sun stroke! 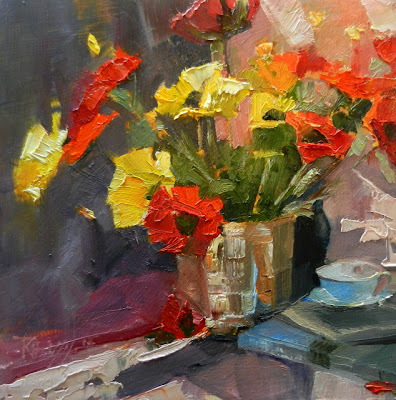 But of course, still trying to catch up here on the blog, I'm posting a still life from the indoor paint out in Feb! Sylvia Carlton, founder of PAWA was crowned lifetime member at the meeting. My friend and painting buddy Darrell Anderson gave the still life a try . 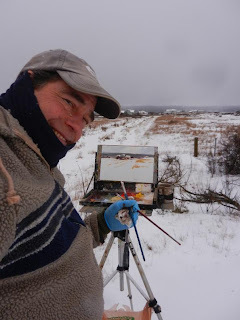 Coming up in my next posts are the paintings I did on Whidby this weekend....After I got the van stuck in the parking lot of the Keystone Cafe , there wasn't much else to do but paint! 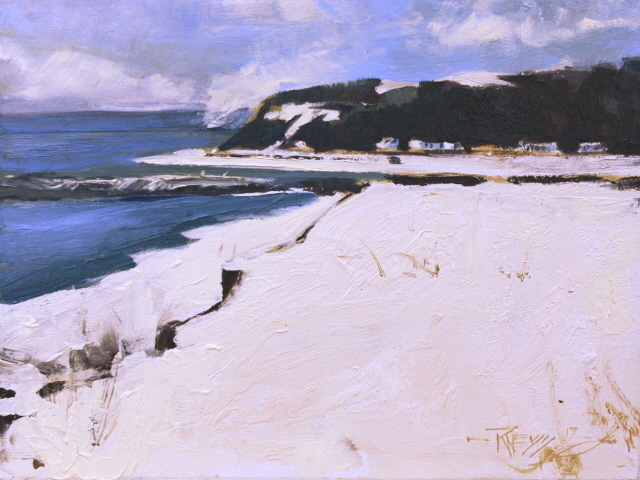 This is a companion piece painted at the same time as my last post and bought by the same collector!. (Thanks Brian! !..=] )...I also missed posting this one....go figure.....I must have been way over-caffeinated! My wife and I love travelling around our beautiful state! I painted this from a photo, taken on a loop ferry trip to Alki Arts. We went over on the Bainbridge Island ferry and came back via the Fauntleroy / Vashon ferry..This scene is Vashon Harbor. There are also lots of other fun ferry loop trips you can make that feature some of the most stunning views in Western Washington. So get out there this summer and soak up the beauty!! 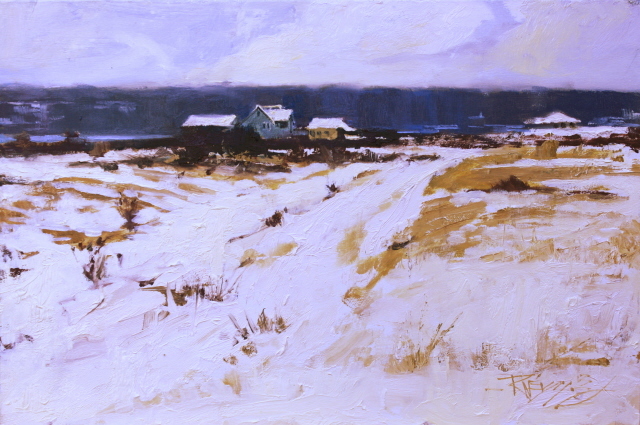 A kind collector bought this painting at Alki Arts gallery show last night (Thanks Brian!) and when I went to my blog to mark it sold, realized that it was never posted....So here it is!! 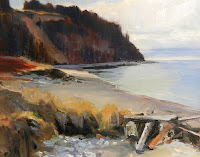 We had a great time at the Second Thursday Artwalk on Alki Beach...Thanks so much to all who were able to make it out! It's always nice to visit with friends.... and to mark paintings sold! 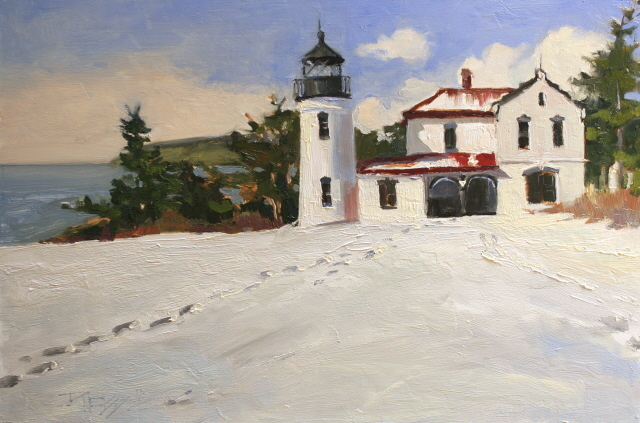 I'm saving this painting to enter into Plein Air Washington Painters , State Parks Centennial Show in September. 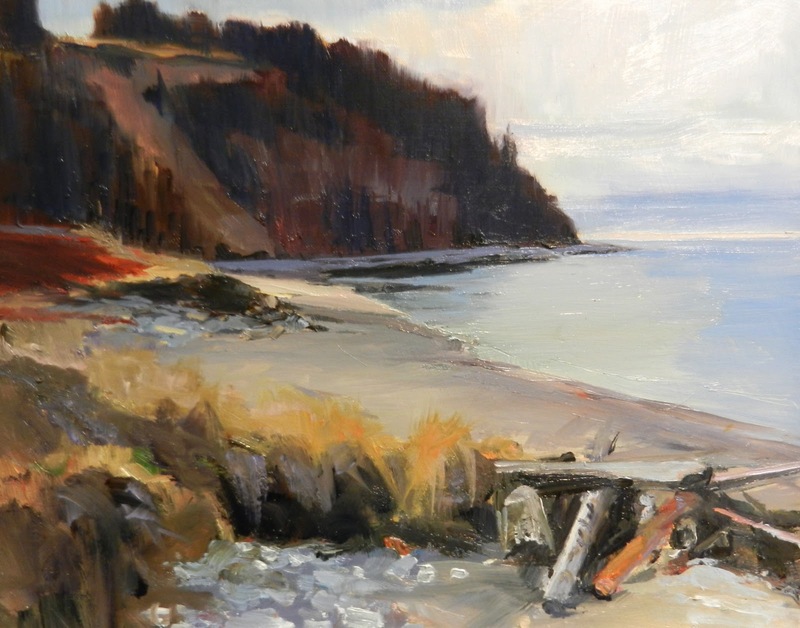 A juried group exhibition will be hosted by The American Art Company in Tacoma for the PAWA members. Each entry will consist of a plein air painting done on location at one of the Washington Sate Parks (of which there are 117) and the accompanying studio painting done from the plein air study. I'm really looking forward to seeing the work that will be generated for this major show. 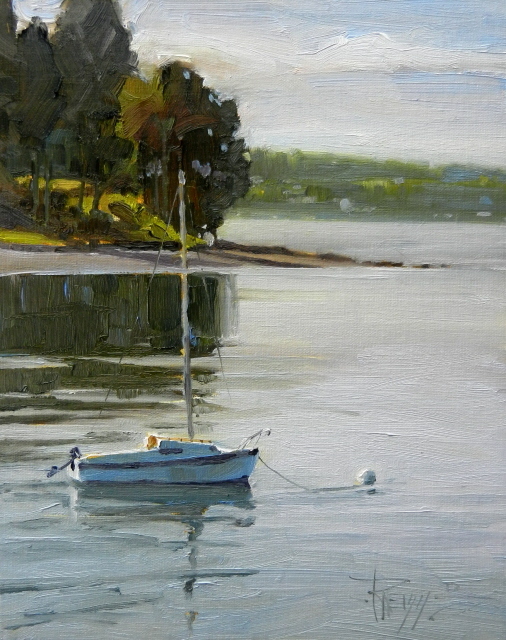 It is an honor to be able to join the talented and fun loving Plein Air Washington Painters! I'll be posting more on this show as the date gets closer....in the mean time I have two featured artist shows coming up associated with Alki Arts who represent my work in Seattle. The first is Thursday March 14th at Alki Arts on Alki Beach in West Seattle for their Second Thursday Artwalk. I'll be there from 6:00pm till.9:00pm..If you are in the area , stop by and say hi! 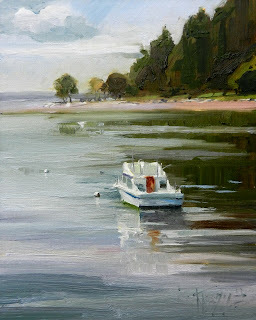 The second opportunity to see some of my recent work will be First Thursday in May at the Harbor Steps gallery across from the Seattle Art Museum at the bottom of The Harbor Steps. Come by , have a glass of wine, check out the art and then walk up to the SAM for a reduced rate on the new "Early Masters" exhibit. While I'm on the topic of doing value studies for larger studio paintings I want to post the progression of images and ideas that lead to this larger work entitled "Space Race"
I started out with this obscure photo taken while driving to my sons apartment in Bell Town. I've talked in other posts about taking pictures while driving...I do not recommend you do this! I have a lot of practice and can take these pictures without looking at my camera or being distracted from driving....seriously! I liked the break up of the big shapes in the photo so I worked out some simple compositions placing the Space Needle in different positions and using different formats. This is a crucial stage....I am learning!... As you can see they don't have to be great works of art....just simple thumbnail sketches working out big shape placement. The next step was fun! 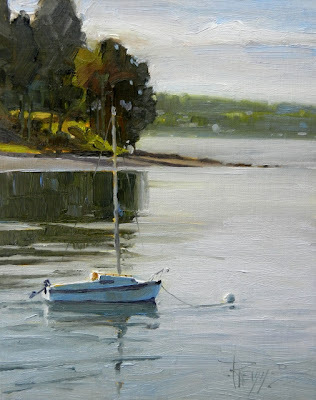 After I picked the shape placement that looked the best to my eye, I put some black, white and portland grey medium, paint on the palette and did a fast value painting in oil . As you can see here, this established some of the drama and atmosphere of the painting. The next step I didn't plan but it helped with the final painting. My wife and I attended the Nicolai Fechin exhibit at the Fry Art Museum in Seattle.I was struck by the rich impasto application of the paint. When I came home to work on this painting I scraped all the paint off my palette into piles of greys, loosely mixed. I then added a lot more paint than usual for me to lay in thick layers with the dryed clumps of paint mixed in. This enhanced the feel of the sort of "gritty city" piece I was hoping to achieve. Hope this helps you in making some of your compositional decisions! Happy painting!